Cairns is unique. It is, for the tens of thousands of backpackers that flow up the eastern coast of Australia, the end of the line. It is their final destination and it has a final destination feel about it. It also has a very heavy focus on adventure activities for backpackers. But, more than anything else, it is the major tourist destination in North Queensland. An international airport; a superb Aboriginal theme park; a Skyrail with aerial gondolas which float above the tropical rainforest; charming hinterland villages with craft markets; and a rich variety of modern accommodation and eating options attract visitors all year round. But the special appeal is to catch a boat – a catamaran or a sailing vessel – and head for the Great Barrier Reef and the islands (many of which are unspoilt coral cays) that are all easily accessible from the city’s harbour. Cairns is an aggressively modern city driven by tourism. Its fundamental raison d'etre is to attract tourists and to provide them with a wealth of ways to spend their money - from gift shops, reef visits, snorkelling, Aboriginal artefacts and culture, nightclubs and forays into the hinterland to places like Kuranda and the Atherton Tablelands, opal shops, deep-sea fishing, adventure holidays to Cape York, seafood restaurants, white-water rafting, catamarans and helicopter joyrides. Cairns is located 1712 km north of Brisbane on the National Highway which runs up the coast. In 1876 Cairns was named after the Governor of Queensland, Sir William Cairns (1875-77). Prior to that it had been known as Trinity Bay, a name given to it by Captain James Cook who recorded in his diary for Sunday 10 June: 'The shore between Cape Grafton and the above northern point forms a large but not very deep bay, which I named Trinity Bay, after the day on which it was discover'd." Located on the corner of Abbott Street and Wharf Street, and now surrounded by high rise apartment blocks, this historic hotel, originally known as the Empire Hotel, was built in 1926 and captures the spirit of early, wild Cairns. The Queensland Heritage Register records: "The building is two-storeyed with a wide verandah attached to parapet walls running along Wharf and Abbott Streets. The verandah is supported on heavy timber posts evenly spaced with the posts each side of the corner at the street intersection missing, which is an original feature. The verandah has a plain slatted balustrade at first floor level and below this a later skirt with segmental profile of slatted boards between the supporting posts. The verandah has been enclosed at first floor level along Abbott Street. The parapet wall is finished at the top with a heavy cornice with wide dentil course supported on fluted pilasters beneath." It notes of its important that "The Barrier Reef Hotel survives as an important illustration of the growth and rebuilding of Cairns in the interwar years, when Cairns was transformed from a late 19th century backwater into a progressive, 20th century city. The building is important also as an illustration of the emphasis placed by Cairns architects and builders of the interwar period on reinforced concrete as a suitable building material for a tropical, cyclone-prone environment." For more detailed information check out https://environment.ehp.qld.gov.au/heritage-register/detail/?id=601608. Located at 6-8 Abbott Street, one block from The Esplanade, and now the Cafe China Noodle Bar, this elegant Classical-style building was designed by Robert Henry Bowen and built in 1936-1937. It was constructed post-Depression and helped create employment. It is the third Customs House on the site. It was a response to Cairns becoming the third largest port in Queensland. The Queensland Heritage Register describes the building as "An inter-war two-storeyed rendered cavity brick building, with hipped terracotta tiled roof. The building is square in plan with a projecting entrance portico and balcony. The entrance facade to Abbott Street is decorated with moulded details that are classically derived including double height pilasters, which rise to a stepped parapet. On the upper level of the Abbott Street elevation all the openings have timber shutters. All the windows and French doors in the building are multi-paned. Internally the ground floor contains the Long Room and four offices, with the upper floor being residential accommodation of seven principal rooms. All the rooms on both levels open out onto verandahs and balconies." For more detailed information check out https://environment.ehp.qld.gov.au/heritage-register/detail/?id=600377. This impressive memorial was erected in 1903 to commemorate the work of Dr Edward Albert Koch who was in charge of Cairns Hospital and carried out important research into tropical medicine. He was particularly active in the prevention of malaria being one of the earliest researchers to recognise the importance of mosquitoes as carriers of the disease and developing "Dr Koch's Celebrated Fever Mixture for Malaria" which was a successful suppressant and was marketed throughout North Queensland. The memorial is made from Carrara marble and is located in the park on the corner of Abbott and Spence Streets. For more information check out https://environment.ehp.qld.gov.au/heritage-register/detail/?id=601681. Located at 38-40 Abbott Street, and now the facade of the Cairns Courthouse Hotel and combined with the Cairns Regional Gallery, this is an impressive combination of buildings which was built between 1919-1921 on a site which had been reserved by the government since 1876. Cairns Court House - Completed in 1921 and designed in the Queensland Government Architect's office, the "Court House is a single-storeyed rendered masonry building, with a hipped corrugated iron roof, fronting the Abbott Street gardens to the southwest. The building is T-shaped in plan, with offices and subsidiary court rooms forming the western wing and the main court room forming the eastern wing. The central entrance of the western wing has a recessed porch with a slightly projecting facade surmounted by a stepped parapet with a curved pediment, cornice and a lion and unicorn crest. This is supported by two columns flanked by pilasters and a section of concrete balustrade to either side ... Verandahs are located on the southeast, northwest and between the eastern and western wings. These have timber posts on masonry upstands with timber batten balustrade between, arched timber valance, raked boarded ceilings and timber floors. Arched panelled windows with central hopper sections, lighting the main court room, are located above the verandah line with deep curved timber eave brackets. Below these are French doors, with panelled glass upper portions and hopper fanlights, and casement windows opening onto the verandah. Internally, the main court room contains silky oak fittings including the Judge's bench, which sits on a raised platform with a lion and unicorn crest on the wall behind, the prisoner's dock, jury and press seating and gallery rail. French doors and casement windows are separated by plaster pilasters with cornices above. At the eastern end, former witness rooms are located on either side of main court room. The northern room contains a hardboard ceiling with timber cover strips and the southern room has had an extension to the south to provide toilet facilities." The building was vacated in 1992 and renovated when it became part of the Cairns Courthouse Hotel. Completed in 1931 as Public Offices with the State Government Insurance Office on the ground floor, the building was occupied by Queensland Government offices until 1992-1993 when the Cairns City Council took over and converted it into an art gallery. It is a typical Georgian Revival building. For more detailed information check out https://environment.ehp.qld.gov.au/heritage-register/detail/?id=600376. Located at 151 Abbott Street and built between 1929-1930, these council chambers (now the city library) are, according to the Queensland Heritage Register, of "considerable aesthetic and architectural significance, and together with its surrounding grounds and mature plantings, imbue a formal expression of classical interwar public architecture adapted to suit a tropical climate. The building makes a considerable contribution to the Cairns streetscape, and is an important member of a group of classically detailed inter-war civic buildings designed to re-affirm the power and presence of government in the community." For more details check out https://environment.ehp.qld.gov.au/heritage-register/detail/?id=601576. Located as part of the Catholic complex which includes the Bishop's House, this unusual building was built in 1941 after a design by South African architect, Vibert McKirdy Brown. It cost over £5,000 which, because of wartime restrictions on all buildings over £3,000, had to be approved by the Federal Government. The Queensland Heritage Register notes that "The design was in the Moderne style, with sweeping horizontal and vertical lines and a minimum of architectural ornament. The building was constructed of reinforced concrete throughout - including the floors and roofs of the deep verandas." The city's seeming obsession with reinforced concrete was as a result of a number of cyclones in the 1920s which had destroyed many of the local timber buildings. For more extensive information check out https://environment.ehp.qld.gov.au/heritage-register/detail/?id=601748. Located at 179 Abbott Street, and built to a design by architect and engineer Edward Gregory Waters between 1912-1914, "It remains a fine example of a convent building designed to function in a tropical climate, and is of interest for its re-inforced concrete construction, considered more cyclone-proof than masonry. Together with the nearby Bishop's House and adjacent St Monica's High School Administration Building, St Joseph's Convent is part of a grouping of pre-1945 20th century buildings which, although of different styles, are all of similar scale, materials and planning. Both individually and as a group, these buildings make a significant aesthetic contribution to the Cairns townscape and Abbott Street streetscape, and contribute markedly to the city's sense of physical identity and history." as the Queensland Heritage Register records. For more detailed information check out https://environment.ehp.qld.gov.au/heritage-register/detail/?id=601749. Located at 183 Abbott Street, St Monica's is a memorial to the Battle of the Coral Sea and was constructed in 1967-1968 to designs by noted architect, Ian Ferrier. The Queensland Heritage Register notes: "St Monica's War Memorial Cathedral follows the basic form of the original basilica model of the early churches of the Roman Latin Rite. Bishop Cahill requested the architect to design the Cathedral with arches as a major design element; however Ian Ferrier has said that he found it a challenge to reconcile the use of arches whilst designing in the modernist idiom. He developed a system of reinforced concrete arches along either side of the Cathedral, which house leadlight windows surmounting doors to side verandahs. The side arches were designed in concert with a vaulted ceiling; however due to cost constraints, the vaulted ceiling was eliminated and a flat soffit erected in its place which internally obscures the top of the arch. The Cathedral was constructed with a reinforced concrete frame, with inner and outer skins of brickwork, and the side verandahs were designed to allow the side doors to be left open, particularly during the wet season, to allow cross ventilation. The original design included transepts, which were deleted due to cost constraints; however a section of the southern transept was retained as a side chapel. The original design of the Cathedral also called for more extensive use of marble, particularly to the floors of the nave and sanctuary. The architect's original intention for the leadlight windows was to eventually house stained glass when funds permitted, but in the interim to use gold and light blue glass as per his design for the Sisters of Mercy St Bernard's College, Herberton. However Bishop Cahill did not like the colour blue and requested that the windows be constructed with a field of burgundy red glass with an amber border. It was not until the glass was being installed that the enormous impact of the vast areas of burgundy red glass began to be felt. However, as the glass had been paid for and delivered to site there was no option but to install it." For more detailed information check out https://environment.ehp.qld.gov.au/heritage-register/detail/?id=601961. Located on the corner of Abbott Street and Minnie Street, this handsome, two storey building, erected in 1930 as a monastery for Augustinian fathers, is now the residence of the local bishop. It was designed by Father Joseph Phelan (Parish priest 1927-1937) and has a strong resemblance to buildings constructed by the British in Colonial India. The Queensland Heritage Register records that "The Bishop's House survives as important evidence of the re-building of Cairns in the 1920s and 1930s, during which period the city's status as the principal port of Far North Queensland was consolidated and the city centre was re-built. It also illustrates a tradition of building in re-inforced concrete, favoured in cyclone-prone Cairns since the early 1900s." For greater detail check out https://environment.ehp.qld.gov.au/heritage-register/detail/?id=601747. Located on the corner of Lake Street and officially at 93–105 Lake Street, this building was constructed between 1907 and 1941 it now houses the excellent Cairns Historical Museum which has a good display of history relating to Cairns and the region. Its documentation of the town's history, from Cook's arrival through its maritime history and the arrival of the railway, is complemented by important displays of Aboriginal artefacts and the Great Barrier Reef. The building itself with its wide verandas is an excellent example of the kind of architecture which ensured Cairns' reputation for elegance before World War I. For more information check out https://environment.ehp.qld.gov.au/heritage-register/detail/?id=600380. It underwent considerable renovation in 2017. Located over the road (mall) from the Historical Museum at 87 Lake Street, Hides Hotel was built in 1928. It was named after the publican, George Parker Hides. It has been estimated that the building cost £30,000. At the time of construction, it was one of the largest buildings in Cairns, and was one of only two three-storeyed structures in the city, the other being Boland's Centre at the corner of Lake and Spence Streets. For more detailed information check out https://environment.ehp.qld.gov.au/heritage-register/detail/?id=600382. The street outside Hides Hotel and the School of Arts has been turned into a Mall known as Shields Street Heart and the public art - ranging from the Meeting Place with tiles around the impressive fig tree through to the Storywater Brothers and the Yam Vine bike racks is worth a visit. There is a very detailed and comprehensive description of all the art works which can be accessed at http://www.cairns.qld.gov.au/council/major-projects/city-centre-alive/ssh_art. Located on the corner of Lake Street and Spence Street, the Bolands Centre (as the Queensland Heritage Register explains) is "a large reinforced concrete former department store, was erected in 1912-1913 for Michael Boland, an Irish immigrant who migrated to Australia in 1881 and became a leading merchant in Cairns. The building was designed by the Cairns architect Edward Gregory Waters, and for many years was the tallest structure in the city. It is the last surviving example of a large, early 20th century department store in Cairns." The Register explains the building's importance as "The place is significant because of the inclusion of a number of innovative ideas. In its scale and striking design the building represented a creative achievement for Cairns at the time. The construction process was a major undertaking and required some technical innovation. The building was one of the earliest large commercial structures in Far North Queensland to be entirely constructed of concrete, a practice that would later become common due to the capacity of concrete to cope with the tropical climate and cyclones. The structure was also the first large building in Cairns, and among the earliest in Far North Queensland, to incorporate an electric passenger elevator. When it was completed the Bolands Centre was to be among the first modern department stores in Far North Queensland. In later years it continued to incorporate new technologies and ideas." For more detailed information check out https://environment.ehp.qld.gov.au/heritage-register/detail/?id=602536. Located on the corner of Lake Street and Spence Street at 39-49 Lake Street, this remarkable building still looks like a hotel. It was built in 1908-1909 for Cairns businessman, William John Munro, with the idea of constructing a hotel and a number of shops on the street corner. The Queensland Heritage Register notes that "The building exhibits Art Nouveau and Federation influences in its design. Decorative parapets provide a prominent skyline feature, with an asymmetrical combination of piers surmounted by cupolas projecting above, with curved gables and a cylindrical corner tower with cupola." For more detailed information check out https://environment.ehp.qld.gov.au/heritage-register/detail/?id=600379. Located on the corner of Lake Street and Spence Street at 37 Lake Street, this modest structure was completed in 1910. The building was designed in the newly developed Arts and Crafts manner, established in Europe and adapted to the Cairns tropical climate. The unusualness of the building is well captured by the Queensland Heritage Register description: "The building has a corrugated iron roof with shaped end gables and sprocketted eaves, which are supported by curved metal brackets and pierced by tapering piers with shallow ogee shaped gablets above. The corner and end piers are surmounted by spheres. The building has arcaded verandahs to both street frontages, consisting of five bays to Lake Street and three to Spence Street, with large rounded fabric awnings attached. There is a shallow ogee shaped central gable to Lake Street, which originally surmounted the entry but now houses a recessed window, with the words THE ADELAIDE STEAMSHIP CO LTD in relief and a sculpture of one of their vessels above. Sections of concave solid balustrade have been removed to provide access to a relocated corner entry, and end bays have timber framed casement windows." For more details check out https://environment.ehp.qld.gov.au/heritage-register/detail/?id=600381. In 1988 the Jack Barnes Bicentennial Mangrove Boardwalk was opened allowing visitors to learn about Australian tropical mangroves and saltmarshes. Located off Airport Avenue (the main route out to the airport) and clearly signposted, it allows visitors to explore mangrove swamps from 2 km of elevated boardwalks - 800 metres to the north and 1.2 km to the south. The MangroveWatch website explains: "The northern boardwalk extends to Little Barron Creek where viewing platforms are provided at the creekside. About half way along the walk, a canopy tower offers a view across the tree tops. This section of the walk returns in a circuit to the car park. Signs are placed along the boardwalk to provide information on the many ways that plants and animals have adapted to this interesting environment. The southern boardwalk offers a slightly different experience and explores a number of different types of mangrove forests. This section terminates at a canopy tower near the mouth of Swampy Creek. Signs along this section provide information on the productivity of mangrove forests." For more information check out http://www.mangrovewatch.org.au/index.php?option=com_content&view=category&id=72&layout=blog&Itemid=300189. Fitzroy Island is 324 hectares of tropical rainforest. It is almost completely surrounded by coral reef and has a peak which rises 271 metres above sea-level. It is only 45 minutes by fast ferry from Cairns. The island is predominantly National Park which comprises tropical rainforest, mangroves, coral beaches and excellent walking paths. The main activities include walking, snorkelling, swimming, sea kayaking, viewing the reef by glass bottom boat and just simply relaxing. For detailed information check out http://www.fitzroyislandcairns.com. For many years Green Island was one of Cairns' prime tourist attractions. A small, uninhabited coral cay it had nothing more than a jetty and a marine viewing point. The addition of a resort has detracted from its primitive charm. It now has a Marineland, a Barrier Reef Theatre, snorkelling trails, accommodation and a range of eating facilities. Green Island was the setting for an innocent pre-marital holiday for Joe Harman and Jean Paget in Nevil Shute's novel A Town Like Alice. Today it is the most accessible of all the islands and is notable for the fact that, as a coral island, you can literally step off the beach into the coral reef. Walk down to the harbour in the morning, catch a ferry across to Green Island (they leave at 9.00 am and 11.00 am) and 45 minutes later you will be lying on the impossibly white coral and sand beach; snorkelling through dense gardens of coral surrounded by fish and, if you are lucky, watching green turtles pass slowly through the crystal-clear, turquoise waters; or gazing at the reef formations from an underwater semi-submersible. (http://greenisland.com.au). If you fall in love with this very small and idyllic piece of tropical paradise you can always stay at the island’s resort. By the late afternoon there will only be you and the other guests to enjoy the quietness and the beauty of the sun setting across the waters. (http://www.greenislandresort.com.au). The Flecker Botanic Gardens in Collins Avenue, Edge Hill (they can be accessed on the way out to the airport), are widely regarded as the most impressive botanical display in North Queensland with over 10,000 species and excellent views over Cairns. The gardens were started in 1886. They now cover 38 ha and take their name from Dr Hugo Flecker, a keen botanist and biologist who established the North Queensland Naturalist Club and was actively involved with the gardens from the 1930s through to the 1950s. Of particular interest is the Aboriginal Plant Use garden which consists of plants utilised by local Aborigines for medicine, food, weapons and shelter. A specific map is available to download at http://www.cairns.qld.gov.au/__data/assets/image/0008/59417/wFlecker-Garden-Aboriginal.jpg. The gardens are open from 7.30 am - 5.30 pm on weekdays and 8.30 am - 5.30 pm on weekends. Entry is free. There are daily conducted tours which start at 10.00 am and start outside the Friends House. 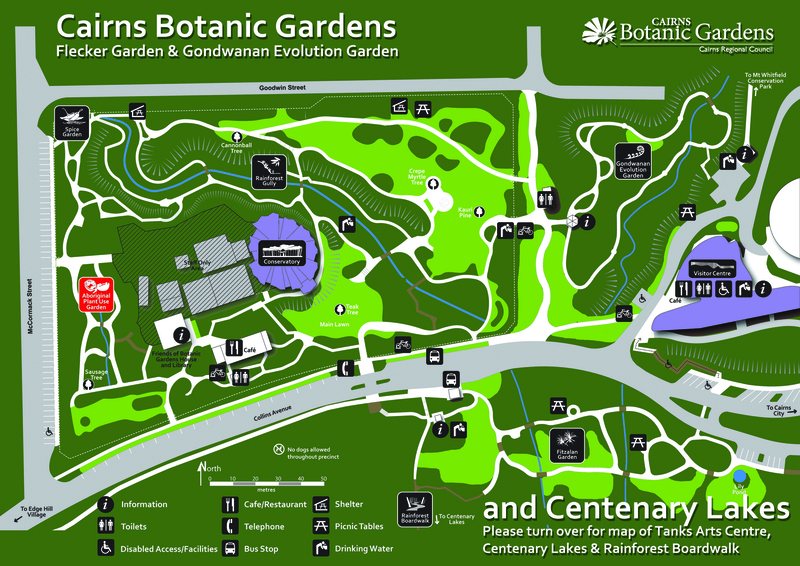 For more information and a virtual tour of the gardens check out http://www.cairns.qld.gov.au/cbg/visit/visitor-information. The gardens are the starting point for a number of walking tracks in Mount Whitfield Conservation Park. There is a downloadable map at http://www.cairns.qld.gov.au/__data/assets/pdf_file/0003/92766/MTWRedBlueGreenArrows.pdf. Redlynch is famous in the literary life of Australia. The great (and, sadly, now forgotten) novelist, Xavier Herbert, lived here for 34 years (from 1951 onwards) during which time he worked at the local pharmacy (on Saturday mornings) and wrote the mammoth Poor Fellow My Country in a shed out the back of the house. Published in 1975 it is still Australia's longest novel running to 850,000 words. It won the Miles Franklin Award in 1975. Herbert lived opposite the railway station at 399 Kamerunga Road. For a detailed account of Herbert and the cottage he lived in, check out https://environment.ehp.qld.gov.au/heritage-register/detail/?id=601739. In recent times the simple house has been changed beyond recognition from the home that Xavier Herbert lived in. It has been a major tourist attraction since it was completed in 1915. In the early days the Cairns to Kuranda railway was simply a spectacular rail journey topped off by an impressive railway station with a rich tropical garden and, perhaps, a cup of tea at the hotel in Kuranda. The Kuranda railway is simply the most scenically beautiful railway line in Australia with one section actually running across the face of the Stoney Creek Falls and other sections winding around the hillside and through no fewer than 15 tunnels and 39 timber and steel bridges. At various points there are views back across the Coral Sea. It was built by John Robb between 1886 and 1891 and is recognised as a masterpiece of railway engineering. In 1915 the Railway Station at Kuranda was completed. One amusing sideline is the way the Barron Falls are used. In the dry season the water over the falls reduces to a trickle. However, to provide the tourists with good photos, just before the tourist train arrives at Barron Falls Station someone opens one of the floodgates and, quite miraculously, the falls begin to fall. The railway is listed in the Queensland Heritage Register with detailed information about its construction. Check out https://environment.ehp.qld.gov.au/heritage-register/detail/?id=600755 for more details. With a base located at Smithfield to the north of Cairns, the Skyrail is one of the technological and scenic wonders of Australia. It stretches 7.5 km across the rainforest canopy and, when it was constructed, it was the world's longest gondola cableway. Passengers begin their journey at Caravonica Lakes (15 minutes north of Cairns) or Kuranda. There are two stops. The Red Peak Station and the Barron Falls Station. The Red Peak Station is located in the middle of the rainforest and allows travellers to explore the forest floor on a series of boardwalks. The Barron Falls Station has a Rainforest Interpretative Centre which was developed in conjunction with the CSIRO. A short walk through the trees takes visitors to the edge of the Barron Gorge for spectacular views of the Gorge and the Falls. For more information and bookings check out https://www.skyrail.com.au. The Tjapukai Cultural Theme Park is a unique and richly rewarding attempt to explain Aboriginal culture (in this case the society of the Djabugay and Yirrgandyji peoples) in a broad thematic way. It offers visitors a rare opportunity to experience Aboriginal culture through a Cultural Village (with Boomerang and Spear Throwing), a Creation Theatre (in which the story of creation is told in the Tjapukai language - with headset translations) , a History Theatre (an overview of Aboriginal history in the past 120 years with an unswerving honesty and an ability to look at the massacres and maltreatment as part of that history) and Magic Space with giant murals. Visitors can experience all the performances in a 2 hour period although the Theme Park suggests allocating three hours for the full experience. The Theme Park is a powerful statement of what it means to be an Aborigine. The power of the experience rests on a strange mixture of the educational (each dancer explains a particular aspect of Aboriginal life ranging from the boomerang to the didgeridoo, songsticks, spears and clothing), a clever blend of ancient and modern in both the dancing and the singing, the enactment of a tribal legend which is easy to follow, a genuine rapport which the troupe establishes with the audience, a buoyant sense of humour, and a constantly reiterated theme of 'Proud to be an Aborigine'. The result is an entertainment which leaves the audience elated and educated. For more information and bookings, check out http://www.tjapukai.com.au. Over the past thirty years the beaches to the north of Cairns have evolved from isolated communities to thriving modern holiday destinations with stinger nets on the beaches, swimming pools in many of the apartment blocks, and wall-to-wall apartments and holiday accommodation. They are now commuter suburbs of the city. Yorkeys Knob has the most interesting history. It was named after a one-armed beche-de-mer fisherman who used the point as a base for his angling activities at the turn of the century. During World War II it became a popular haunt for American servicemen on R & R leave. In recent times it has been joined by Trinity Beach, Clifton Beach, Palm Cove and Double Island - all of which have seen upmarket accommodation being built. * Prior to the arrival of Europeans the area was home to the Yidinji Aboriginal people. * Captain Cook was the first European to see the site of modern-day Cairns. * In June 1770 he sailed into an inlet which, because it was Trinity Sunday, he named Trinity Bay. * The area wasn't settled by Europeans until October 1873. The discovery of gold at Palmer River and Hodgkinson field meant that port facilities were created at Cairns. * One miner, Bill Smith, had worked around Trinity Bay as a fisher of beche-de-mer (sea cucumbers) before becoming a prospector. He was convinced that the bay would prove a suitable port. In 1876 he successfully cut a track from Trinity Bay across Freshwater and the Barron River to the Hodgkinson River goldfields. Smithfield to the north of Cairns is named in his honour. * In 1876 the local policeman on the Hodgkinson field, Inspector Douglas, was instructed to cut a track down to the coast. Within the space of two months there were two tracks from the goldfields to the coast. * A small township was established on the present site of Cairns in late 1876 but it was short-lived because the land was swampy. Smithfield became the more important of the centres and within a year it had eleven stores and hotels. It quickly gained a reputation as 'the wickedest town in Australia' and legend has it that Bill Smith, who became a publican in the town, made so much money from the gold miners that he had his horse shod with shoes of gold. * On 6 October 1876 the Porpoise arrived in Trinity Bay with a postmaster and customs officers aboard. The public servants cut out an area for themselves near where The Esplanade now stands. * On 1 November, 1876 Trinity Bay was declared a port of entry and clearance. It was renamed after the then-Governor of Queensland, Sir William Cairns. * In spite of these official actions Smithfield remained the more popular of the two settlements. By November its population had reached 150 and it was growing rapidly. * In 1877 Smithfield was totally destroyed by a freak flood on the Barron River. * In 1877 £132,407 worth of gold passed through the port. That year saw the first land sales in Cairns. * A hospital was opened in 1878. This was the year of the town's first cyclone. * The Cairns local government division was proclaimed in 1879. * By 1882 Cairns was suffering from a serious economic depression. That year saw the planting of sugar plantations in the Mulgrave and Russell River. A sugar mill was opened at Hambledon in 1882. * A railway from Cairns to Myola (just beyond Kuranda) was completed in 1886. * By 1887 the population of the town had reached 1500. * In 1887-1888 the harbour was dredged. * In 1898 the Mulgrave sugar railway was opened. * A cyclone seriously damaged the town in 1899. * Cairns was gazetted as a town in 1903. * The heritage listed wharf area was completed in 1910. * Cairns became a city in 1923. * The railway line from Brisbane reached the city in 1924. * A cyclone seriously damaged the town in 1927. * The Cook Highway from Cairns to Port Douglas was opened in 1933. * Cairns became an important air and naval base from 1942-1945. * By 1949 the city had 18 guest houses and 24 hotels. * A drive-in cinema opened in 1961. * The Tobruk Memorial Baths were opened at North Cairns in 1962. * By 1971 Cairns population was over 30,000. * In 1984 the airport was upgraded to international standard thus giving the city a major tourism boost. * By 1987 the city had 6,500 hotel rooms. * The city was hit by Cyclone Justin in 1997 causing considerable damage. * The Cairns shopping centre opened in 1997 with 180 outlets. * The city was hit by Cyclone Rona in 1999. * The city was seriously damaged by Cyclone Steve in 2000. * The city was hit by Cyclone Abigail in 2001. * The Esplanade was updated and modernised in 2003. * In 2006 the municipality had a population of 127,438. * The city was hit by Cyclone Larry in 2006. * In 2008 Cairns City amalgamated with Douglas Shire to form the Cairns Regional Council. * The city was hit by Cyclone Yasi on 3 February, 2011. * The Sunlander rail service from Brisbane stopped in 2014. It was replaced by the Spirit of Queensland in 2015. Cairns & Tropical North Visitor Information Centre, 51 Esplanade, tel: (07) 4051 3588. There is a very useful and comprehensive local website. Check out http://www.cairnsattractions.com.au. Cairns Harbour from the air. View to the north from the centre of Cairns. Barrier Reef Hotel (1926) dwarfed by high rise apartment blocks. The walk in the harbour park beside The Esplanade. The foreshore at sunset - not a swimming beach in sight. A traditional dance at the theatre in the Tjapukai Aboriginal Cultural Park. Traditional fire making, part of the theatre display at the Tjapukai Aboriginal Cultural Park.